MEDICAL staff and members of the community came together at Gympie Hospital today to celebrate the arrival of a new life-saving piece of equipment. The Non-Invasive BiPAP monitor has been described by staff as an important and long sought after addition to the hospital. 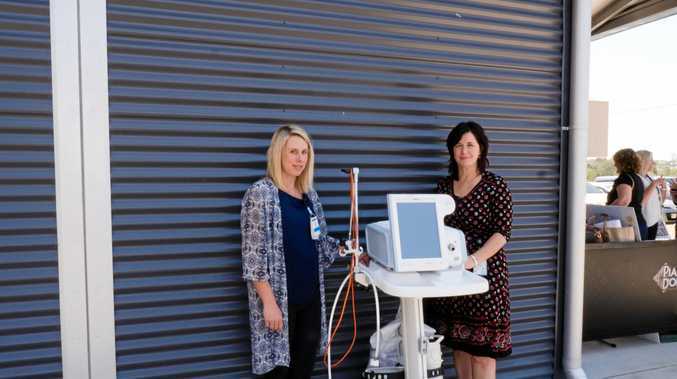 "We'll be using this for life-threatening respiratory situations,” said Kimberley Milner, Nurse Unit Manager at Gympie Hospital. The monitor has been designed for patients with respiratory complications, including chronic obstructive airways disease, pneumonia or sleep apnea. The addition of the machine allows patients to be treated more comprehensively at Gympie. "In the past we would have had to transfer them to either Nambour or one of our larger tertiary facilities,” Ms Milner added. The funds to purchase the $38,000 monitor were raised through community efforts, including $25,000 from the Wishlist Jazz and Wine Festival. "The money was raised through ticketing, fund-raising events and the contribution of various local businesses,” said Wishlist CEO Lisa Rowe.